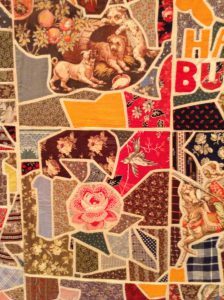 Last year I had the opportunity to make my first pilgrimage to the International Quilt Study Center and Museum in Lincoln, Nebraska. I went with my friend, Edie McGinnis, so that we could see our mutual friend, Victoria, while she was there teaching, and also see her exhibit of quilts the museum had hanging. Naturally, we looked through all the exhibits while we were there, and there were a couple of quilts that particularly struck my fancy. I’ve always wanted to make a tile quilt myself, and this quilt inspired me to get started. 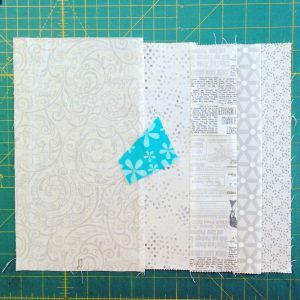 So today I’m sharing the beginnings of my Tile Quilt, and showing you how I’m doing it, and you can just feel free to make one for yourself right along with me, OK? 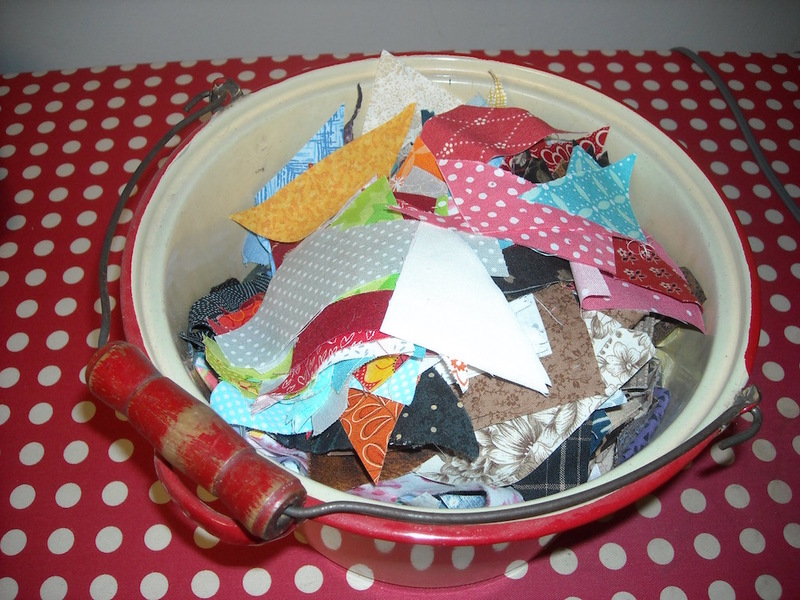 It’s no secret that I have a lot of scraps — too many scraps, in fact. Since my first order of business was to choose a background for my Tile Quilt pieces to live on, I decided that I would also use scraps for that. I’ve decided to use up bits and pieces of low-volumes, or light solids, and piece them together however they work to make base blocks. I just pulled a few pieces from that to start with, and chose one and popped it there in the center, and needle-turn appliquéd it down. Until I had the middle fairly covered. My next step for this block is to square it up to a specific size, which I have not yet determined. 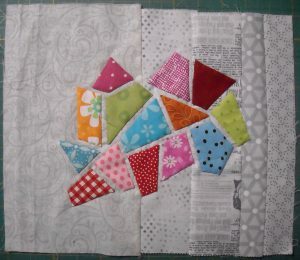 Another scrappily pieced background, and I’ll just place these little pieces all over it. When I get this one’s center filled up, I’ll square it up as well, then I’ll join the two blocks together, and add more tiles to fill in the gaps. My quilt will not have the obvious grid that the one above has — it’ll just look like one big giant field of tiles. Right now my shapes are fairly small and simple, but I may add some more irregular shapes to it as I go to fill in the gaps later. I’ll post more pictures as I get more of it done. I don’t get to sit down and work on it for very long at any one time. I just add a few pieces when I’m too tired at night to do anything else. So it’ll be slow going, but I’m fine with that — it’s not a race. If you’ve ever wanted to make a Tile Quilt your ownself, I hope this inspires you to jump in and join me! You can use whatever method of appliqué you prefer; even raw-edged appliqué would be great (and much quicker), but I enjoy needle-turn and the slow process, so that’s the way I’m doing mine. 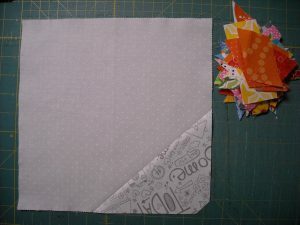 You can also use larger pieces to make it go faster; I chose to use the small ones because that’s the scraps I want to use up. If you want to see how I do my appliqué, I have a tutorial here on appliquéing a leaf that will translate easily into doing these tile shapes. I made a tile quilt a couple of years ago, and was very pleased with how it turned out! Have fun with yours. I like it. I wish I enjoyed handwork! OH! That looks like so much fun! I like to have handwork to do when the mood hits – and I just finished up my last one. This sounds like a winner! Thank you. I can’t remember ever seeing a tile quilt. Thanks for sharing. I have never seen a tile quilt, but I love the concept! 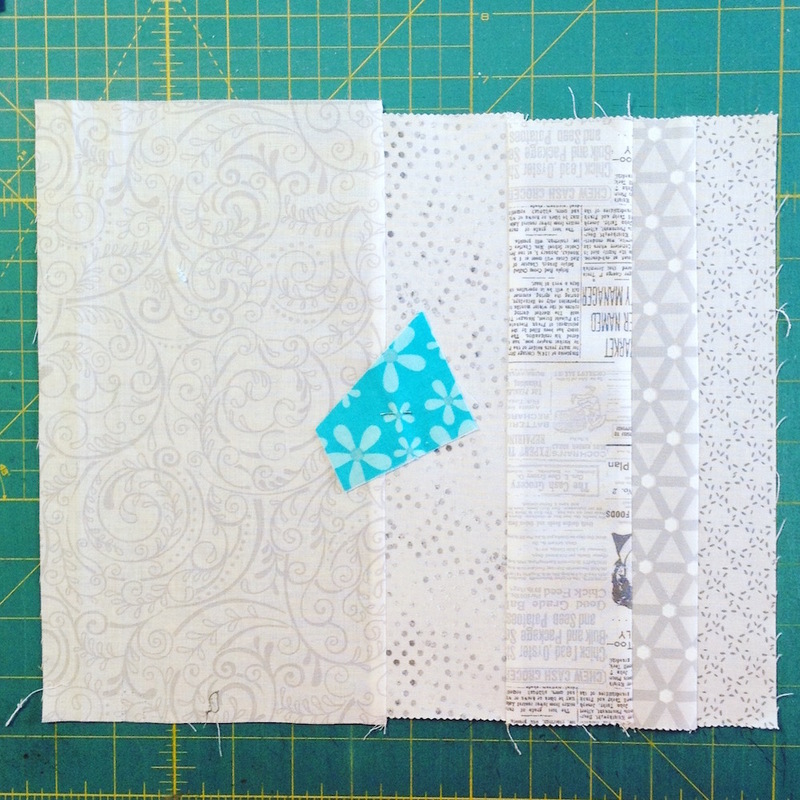 I’m just about to finish up an applique quilt top, so maybe I’ll give this a try. I really like the bright, happy colors you are using. I love hand work. That’s about all I can do right now. This is perfect for ALL my scraps. I think they grow. So cool. You’ve given me a great idea. Thank you so much. But hubby says I have to finish my king size hexagon. I’ve been a year and a half on it so far. I’m not doing Grandmothers garden, I’m just putting a lot of flowers together. 400, 7 2&1/2″ hexies for each flower to be exact. I have about 150 put together so far. Sigh, I’m bored with it right now, I need something new. Maybe this? You just go with the shape of the scrap, right? I am NOT into needle turn applque, but this looks fun. 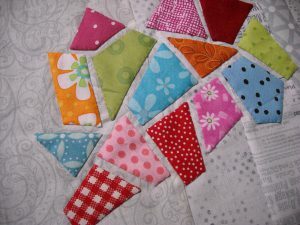 I just LOVE scraps! Oh, this is too tempting to resist! I just watched a program yesterday on tile quilts (not scrappy, but this seems serendipitous). I have to think about this one, since I’m on quilting overload right now and absolutely, positively, unreservedly (is that enough adjectives?) can not start another project. 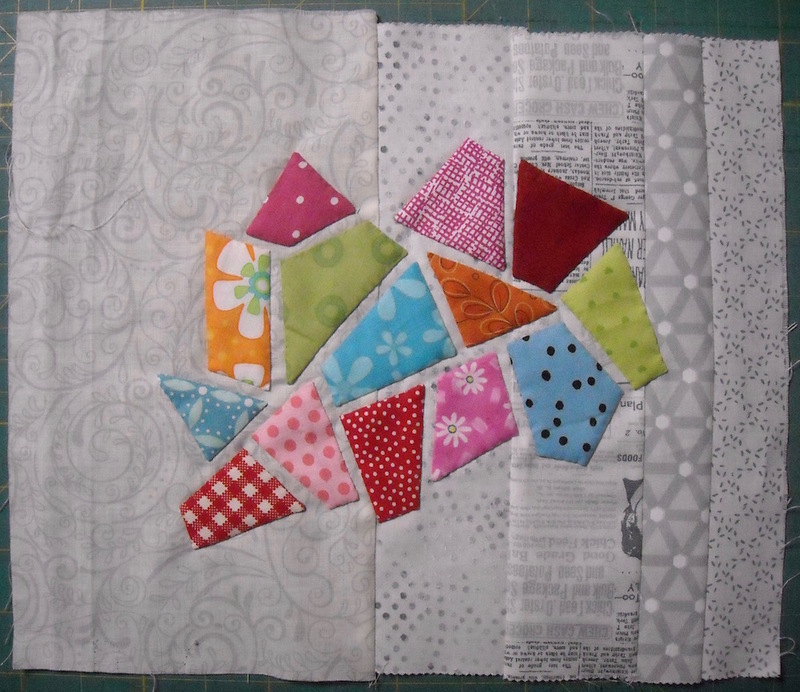 But I have all these perfect background pieces, and scraps by the bundles….maybe if I do a raw edge applique? I believe the temptation may be too much to withstand…. Are you marking your scant 1/4″ on the front of the pieces or just guesstimating? I never thought about making one, but knowing how addictive the Scrap Vortex is, I could see this happening at my house one of these days, too! I like your all-over idea. Will the insanity never stop? 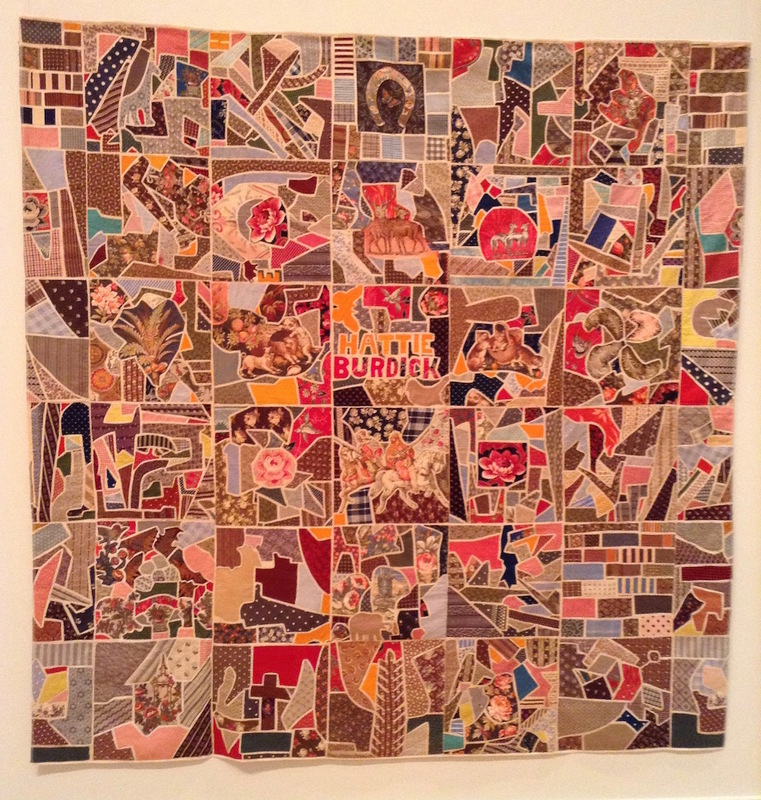 I have never heard of a tile quilt and if I had seen that quilt in that museum, I would want to make one also. I gotta see what to do next. Can I squeeze this in? Nifty beginning. I’d like to do one too – going on my wish list. However with my hurting hands, it will have to be by machine. 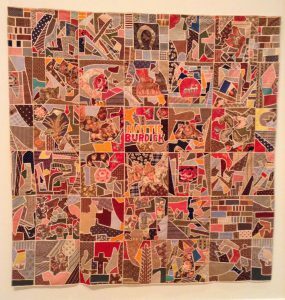 Did you ever finish your tile quilt? 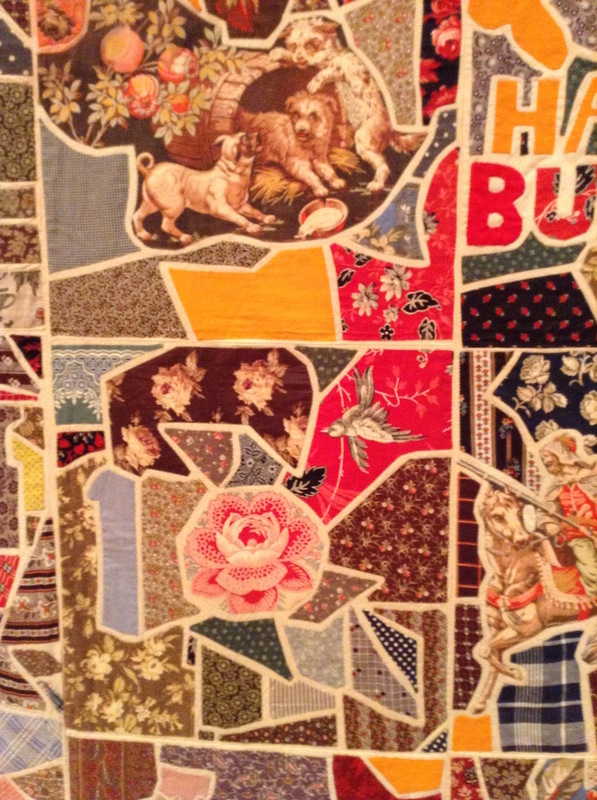 If so, can you show the final quilt?